Webequie is located on the northern peninsula of Eastwood Island on the Winisk Lake, 540 kilometers north of the city of Thunder Bay, or 450 kilometers north of the town of Sioux Lookout. Access is only by air or a seasonal winter road. There is no year-round road access. 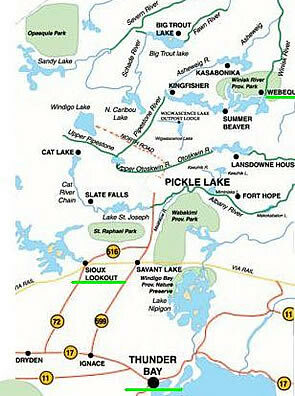 The nearest year-round road access is the town of Pickle Lake, 250 km to the southwest, or the town of Nakina, 320 km to the southeast. 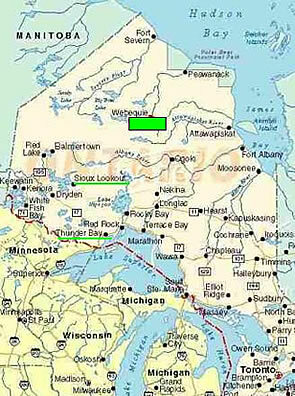 Charter air service to Webequie is available from both of these communities. Scheduled passenger air service from Sioux Lookout and Thunder Bay to Webequie is available from Wasaya Airlines. Scheduled passenger air service from Thunder Bay to Webequie is also available from Nakina Air Service http://nakinaairservice.com/category/flight-service/webequie/. It provides excellent service with modern turbo-prop aircraft. There are several flights daily. It also offers chartered service to Webequie. A flight to Webequie from Sioux Lookout only takes about an hour, and a flight from Thunder Bay about 75 minutes.